Password JDM Washers - Fender Kit UNIVERSAL - Lightning Motorsports - Selling Speed since 1996 ! Add that last finishing touch to your engine bay with these all new Password:JDM fender washers! 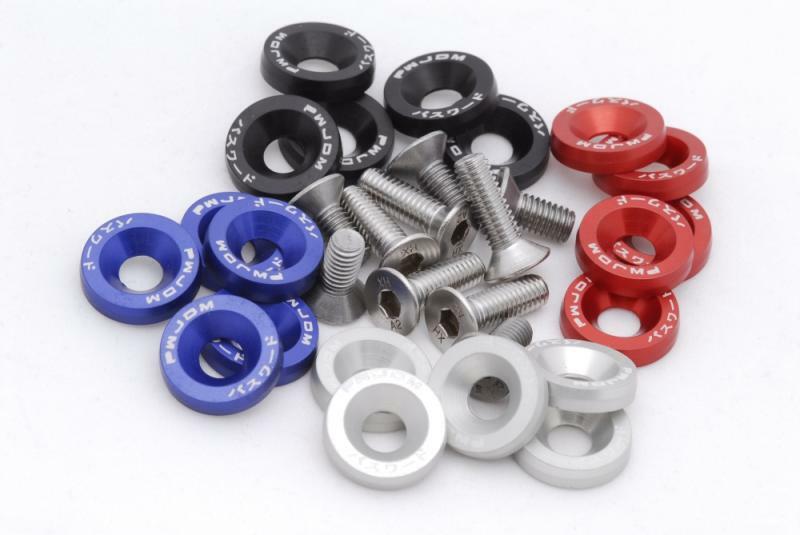 Offered in anodized black, blue, red, and natural silver finish, these fender washers feature the Password:JDM Kenji logo. All Password:JDM fender washers are constructed from aircraft grade aluminum and are matched up with long lasting stainless steel bolts. You may either order the fender washer kits with 6Mx14 or 6Mx20 stainless steel bolts. The fender washers will fit any 10mm bolt hole under the hood of your Honda. The 6Mx20 is recommended for headlights or any other parts that requires a longer bolt. The 6Mx14 can be used for everything else such as fender, bumper, etc.